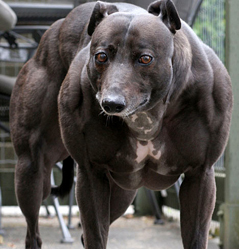 That’s ‘Wendy the Whippet’, aka “muscular dog”. Wendy has a Myostatin deficiency. Looks more like a pitbull with a skinny head! You see, we all have the breaks automatically put on our muscle growth rates. Having this deficiency takes the breaks OFF i.e. you can grow fast! The body actually limits muscle growth with myostatin (It’s a little-known secret that all top bodybuilders have a myostatin deficiency. This coupled with steroid abuse results in those freaky physiques). By the way, simply click here to download my free THT training manual and mobile app to get the best gains of your life! 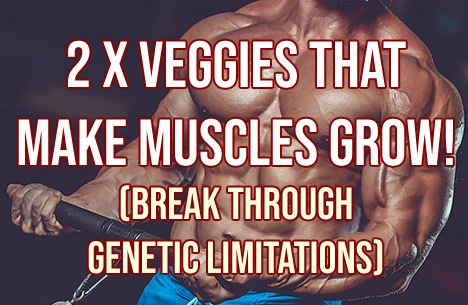 Now, it turns out that 2 x vegetables may actually suppress the myostatin gene, according to researchers at the University of Bonn . Which vegetables? This is great news for me as I eat one or both of the veggies every single day without fail! In fact, we are often advised to eat 5 servings of veg/fruit per day – I weighed mine out recently and I typically eat 9 servings of vegetables every single day. Yep…I eat a lot of vegetables! These 2 vegetables contain a chemical called Glucoraphanin. When digested, this chemical is converted to Sulforaphane. 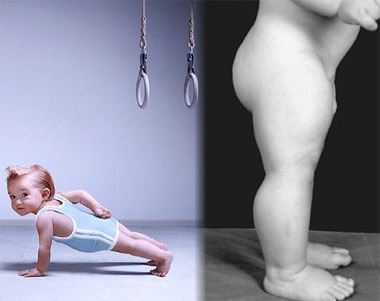 Anything that we can do to inhibit Myostatin will results in faster and bigger gains. NOTE: If you like this kind of tip, I also have 9 ways to jack up the BIG 3 anabolic hormones naturally. Get gains faster by getting this info on manipulating testosterone levels, growth hormone and insulin. So I highly recommend you take advantage of this knowledge by having one or both of these vegetables every day. I’ve already been doing this for years, but that’s just a happy coincidence. I had no idea they contained this chemical. (Note: There are natural supplements available, like this one on Amazon, that deliver 30-50 times more of Sulforaphane into the bloodstream than any other product. However, this is new to me and I’m not aware of any independent studies on them, so don’t ask me about efficacy). “I easily lost 27 pounds and I am in great shape thanks to this program! What Mark is proposing is not your ordinary low fat or low carb diet. You’ll be having protein, carbs and fat, which will make the diet tasty and much easier to follow, without being really hungry. In fact you’ll be surprised of how full you will feel. Interestingly, cooking broccoli and cauliflower makes the nutrients more ‘bio-available’ i.e. your body can get access to, and use more of, the goodness. So don’t attempt to eat these raw, thinking it’s better for you. And puh-lease make sure these 2 x veggies top your list when on a cutting diet – a nice side-effect is that they fill up your belly, for very little calories meaning you can shred fat without feeling hungry. Reference:  “Sulforaphane causes a major epigenetic repression of myostatin in porcine satellite cells.” Epigenetics. 2012 Dec 1;7(12):1379-90. Excelsior! Broccoli and Cauliflower are my favorite and I have been eating them at supper every day. Currently cutting and I’ve been eating both these veggies nearly every day. The enzyme CYP2A6 (responsible for metabolism of nicotine) may be regulated via Sulforaphane’s ability to induce Nrf2, which has been induced up to 1.4fold control levels with 10uM Sulforaphane, and CYP2A6 has been noted to be increased after 6 days of broccoli sprout consumption at 500g per day by a variable 1.4-5.5 fold increase. Variances may be due to differing activity of the Antioxidant Response Element (ARE1) that Nrf2 activation works via. Sulforaphane appears to be able to increase the rate of glycerol release into medium (lipolysis) in a concentration-dependent manner up to 10uM concentration, coupled with an increase in Hormone Sensitive Lipase (HSL) mRNA and CPT1A mRNA (approximately 1.6-fold control) and no effect on Perilipin or ATGL mRNA. Sulforaphane appears to be associated with phorphorylation of HSL at Ser563, which may be indirect through inactivating AMPK via phorphorylating Thr172 and indirectly activating HSL; Sulforaphane’s effects on glycerol release are attenuated when coincubated with AMPK activators, and phosphorylated AMPK was reduced to around 20% of control at 5-10uM Sulforaphane. Variation in content of bioactive components in broccoli. Dietary approach to attenuate oxidative stress, hypertension, and inflammation in the cardiovascular system. In Vivo Pharmacokinetics and Regulation of Gene Expression Profiles by Isothiocyanate Sulforaphane in the Rat. Role of glutathione in the accumulation of anticarcinogenic isothiocyanates and their glutathione conjugates by murine hepatoma cells. Benzo(a)pyrene carcinogenicity is lost in mice lacking the aryl hydrocarbon receptor. The Aryl Hydrocarbon Receptor Nuclear Translocator (Arnt) is required for tumor initiation by benzo(a)pyrene. Deficiency in the Nuclear factor E2-related factor 2 transcription factor results in impaired adipogenesis and protects against diet-induced obesity. The IκB Kinase Complex (IKK) Contains Two Kinase Subunits, IKKα and IKKβ, Necessary for IκB Phosphorylation and NF-κB Activation. The IKK Complex, a Central Regulator of NF-κB Activation. Broccoli sprouts: An exceptionally rich source of inducers of enzymes that protect against chemical carcinogens. Temperature and pressure stability of mustard seed (Sinapis alba L.) myrosinase. Thermal and high hydrostatic pressure inactivation of myrosinase from green cabbage: A kinetic study.